Ugh, I should know that better lunch out never goes quickly when you want it to -_-. They look awesome in that first panel! actually, in the game u usually loose 4 hearts total for that attack.. r.i.p. burnt link..
Too many cartoonists and animators have created really good peices that they stopped working on smack in the middle XD So glad to see this isn't done yet! lol Yea. I work a lot but I do try to squeeze in updates when I can. 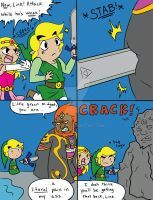 "Breath fire, to 200 degrees Celsius and bake until golden"
Ouch, poor Link. And, damn Navi it Navi show him a little concern will yeh? That said, I reckon it would've looked even better if you had the lost heart piece smouldering or scorched. Look forward to the next part. "Wow, those heads look really cool in that 1st pan-"
"... lol they still look cool." He'd feel a lot better if he threw some bombs in their mouths. 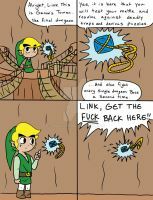 Link must channel his inner Michael Bay. He should use that awesome shield bash again! The impact from hitting one would take him to the other. 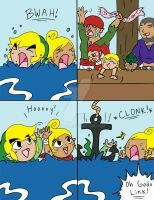 Poor link. He's so done right now. He just wants to back to the forest and take a nap.